Nassim Taleb, as quoted in this BodybyScience.net post. Correlation does not necessarily imply causation; Dr. McGuff tackles this subject early-on in Body by Science. Maybe he anticipated the “hey, you don’t look like you know what the hell you’re talking about”, negative reaction to the underlying premise of his exercise theory. Now, I’m certainly not advocating the total disregard of visual cues when assessing the probable merits of an exercise system and/or modality; I’m simply advocating for good, balanced judgment, objective reasoning — in essence, the totality of informed thought. In a discussion that ensued following Part 1 of this series, I stated that the trainee absolutely must “know thyself”. I can’t emphasis this point enough. In BBS, Dr. McGuff uses the analogy of attending an AAU swim meet and taking note of the ever-increasing number of “swimmer-like” physiques on display in the later rounds of competition. This, in effect, is a display of accelerated evolution geared toward a particular prowess. Someone attending only the later rounds of the meet might conclude — falsely as it turns out — that all swimmers are endowed with this particular, and rather pleasing, body type. This individual might further conclude — again, falsely — that the key to attaining such a physique is to rack-up hours of pool time. What this spectator does not see, however, are the vast majority of competitors — all with an equal amount of “pool time” under their trunks as the finalists — who don’t display anything close to the swimmer’s lithe, supple and streamlined look, however well “in shape” they may be as a result of their training. The point is, that working out like a swimmer will not necessarily give one a swimmer’s physique; on the other hand, if a trainee were born with a genetic make-up that pre-disposes that trainee toward that type of physique, then and only then will said trainee be able to, with a swimmer’s workout, hone a swimmer-like appearance. And to take this a step further, a person genetically inclined toward this appearance will display a “trained” version of a swimmer’s physique irregardless of training regimen. Now, can I take a “genetic swimmer’s physique”, train it like a bodybuilder, and tweak that physique toward a more hypertrophied, bodybuiler-like look? Yes, absolutely — but, however, only subtlety. The bottom line is that certain physique expressions are genetically predetermined, as is athletic ability. Through proper training, though, both can be honed substantially. The take home message here, is that you’ve got to honor your genetic predispositions, and train accordingly. This, then will segue us into the other aspect of the correlation/causation duality I’d like to cover in this part of the BBS review; the appearance of the trainer/coach vis-a-vis the value of that trainer/coach’s knowledge. I’m sure you can guess by now where I’m going with this, but be a good sport and play along anyway. Now, based on nothing but appearance, which of these guys would you take training advice from? Seriously, would you take training advice from either Mark or Greg? Based on their appearance, my guess is probably not. Now, wanna take a wild guess as to which pair of “fitness experts” I’ve tapped for the vast majority of my own training knowledge over the past 5 years or so? OK, so what about this Poliquin guy? Yeah, he knows his stuff as well. And he practices what he preaches. Will his techniques work for you? Well, maybe — it depends on your genetic make up. And knowing what you now know about the effectiveness of the Paleo lifestyle, would you take diet advice from this Lance guy? The point is this: you absolutely must be a savvy consumer of knowledge, especially so in the diet and fitness realms. Unscrupulous people have made (and will continue to make) tremendous fortunes by capitalizing on the general public’s lack of willingness to become informed. So what’s the antidote? Avoid snap judgments made solely on appearance; let appearance, though, play a part in your overall judgment. It’s as simple — and difficult — as that. Know yourself, your genetic limitations (in as much as they can be known), and set realistic goals. Marry the right exercise protocol to your particular phenotype and give it hell. Adjust and recalibrate as necessary; strive for continual improvement. Repeat. In essence, this is what the journey is all about. Late edit: one thing I failed to mention here that I’d wanted to point out was Jimmy Moore’s (of the Livin’ La Vida Low Carb show) interview of Dr. McGuff. Enlightening stuff. absolutely. What always used to annoy me when I was really overweight was the fact that my opinion on what diets worked etc would be totally discarded because obviously I was overweight. It wasn’t until I lost a lot through paleo that some people took notice. The fact is though that in general I think overweight people spend more time reading about diets than normal weight people. I hate(d) it when people who know nothing about losing weight or dieting offer there personal advice on how they ‘stay’ thin. I might be slow, but I am not sure what you were driving at here. Was this a review of “Body by Science”? More of a comment on one portion of the book. No doubt training makes a huge difference. I’m just saying no amount of even specialized training will coerce a swimmer’s genetics to express the phenotype of a powerlifter; nor can we mold a powerlifter genotype into a sprinter. You can, however, through diligent training and diet, express the best of your what your particular genetic makeup is capable of. In terms of the theme of asthetics vs. health or recommended training, a broader question may be “What defines healthy?” Is the ability to run a sub-3 hour marathon helthy? Some would say yes. Others like Sisson would point out the enhanced inflammation resulting from this training and acheivement. You are right that fortunes are made from those that are either genetic specimens in magazines promoting a supplement (for example). All I have to do is take some stuff from GNC and I’ll look like Ronnie Coleman. That aside, I think we all look for improvement in our own asthetics which we interpret as “being healthy” and view those who have better physiques as being more educated or better trained than us and wonder what we are missing. My own viewpoint is that there is a great deal of information available and through trial and error, we have to find the techniques that work for our own machine. We have to set our goals with asthetics and health and constantly adjust the methods to stay on the path to our goals. Once again, thanks for reviewing BBS. Your review of the book’s opening accurately represents my thought…and is very well written! Seriously, you need to write a book. I do strive hard to have a credible appearance (mostly for personal not professional reasons). When Rippetoe speaks, his knowledge comes through to the extent that one is more than willing to overlook his physique. If one goes too far to try to show off their physique as an argument for their training theories it can raise suspicions that they are trying to distract you from a lack of substance. It is a delicate balance. That being said, one must be continously vigilant not to invoke invisible genetic reasons for visible failures of their theories, all while accounting for the complexity of selection bias and survivor bias. Makes more sense now. I thought you were going to do a full review for this and it didn’t make sense with that in mind. The point is pretty clear to me know. Thanks for clarifying. In terms of coaches and their physiques (or lack thereof) please do bear in mind that a huge part of achieving success with the general population is ensuring compliance and convincing them to follow your advice. The more impressive the adviser (let’s not get into the semantics of actually defining what constitutes impressive)the more likely that advice will be listened to. One of the reasons why Charles Poliquin looks the way that he does is that he knew this would mean that athletes and their paymasters would be more likely to listen to him, therefore ensuring him even better results. No doubt. Looking good is definitely a good marketing strategy. I’m just saying that, from a consumer standpoint, don’t disavow a theory simply because the messenger might not have “the look”. Greg Glassman (CrossFit) is a prime example of this in practice. Not just marketing – for most trainers the toughest part of the job is to get the clients to really listen to them. “Train hard, eat paleo” is practiced by many, but those trainers who get the best results the most often are the ones who are most listened to. For the overwhelming majority of trainers this starts with the way that they look. If a guy comes to my gym wanting to build muscle I couldn’t give him a trainer with 14 inch arms regardless of that trainer’s knowledge, because he would start with no credibility and that would minimise the compliance from the client. Glassman is an exception due to his other abilities, and someone like Rippetoe works through the power of the written word – for most coaches and trainers the way that they look is their public statement / business card. You don’t need to look like Mr Universe, but if for example you are going to give advice about building muscles at least make sure that you can prove you have done so one time in your life. To borrow from your good self, I see far too much theory and not near enough practice! I see your point, Nick. To be sure, the Net is rife with keyboard jockeys (all “theory” and no “practice”). Also, I’m under no delusions that a good portion of my readership is here day-in and day-out because I look the part. I just find it ironic that a good portion of my workout theory has been influenced by a guy (Glassman) who’s fat and half crippled ( no slight intended; this is how he describes himself). Also, the theories behind the BBS protocol in a large part derive from the work of Arthur Jones — a fit enough guy alright, but no one you’d take a second look at on the street. Of course all the theory in the world is for naught if someone can’t show results from their application. I have ordered Body By Science and look forward to reading it after checking out all the press it has received. After listening to Dr McGuff on Livin La Vida low carb I took the plunge, Dr McGuff seems to a very knowledgeable person! A few years back I ventured in some Ellington Darden HIT style training and received very good results (Negative chinups are still in my opinion the best upper body mass builder, especially when done weighted) so I am looking forward to trying this out as I am a firm believer that muscles grow when they have received appropriate stimulus. Keith after reading Dr McGuff’s book have you been tempted to change your training methods? This is something I plan to address in a future review. I have incorporated this manner of training in the past — and will incorporate it in the future — with a few caveats. You make good points about Glassman and Rippetoe. To be fair, Rippetoe is more of a power/strength guy, than metcon. From what I have heard, he is pretty strong. But again, even though we know, yes, that correlation does not necessarily imply causation; one cannot simply dismiss correlation — as correlation does not necessarily not imply causation. Art de Vany’s example of the jogger comes to mind. In general, those who jog, have very poor muscle tone and look terribly unhealthy. Why? Cuz they jog and eschew healthier forms of exercise. That is why, while I thought many of Doug’s points are very insightful (e.g. dosage and recovery), I do have some doubts about his philosophy. After all, he makes a bold claim: 12 minutes a week for bodybuilding, strength training and fitness. BTW I know being a skeptic is hideously uncool. Sorry. I am not saying that Keith may not be genetically more gifted than Doug (or me, for that matter). Keith did run track in college, no? BUT what I am saying is that Doug may be less inclined for hypertrophy/athleticism etc etc AND Doug’s workout philosophy may be less than optimal. @Doug I’d love to see more pics/videos showing BBS physiques and learn more about what sort of results you and your team achieve via Body by Science. Aaarrgghh! It did it again. One last try. Looking at some of Keith’s high school pictures posted on this blog, I can fairly confidently say he is playing a better genetic hand than I am. Another reason that Coaches Glassman and Rippetoe can be successful without be specimens is that I think they train potential coaches, not clients, for the most part. Rippetoe’s awesome book, Starting Strength, is written with personal trainers/fitness coaches as the audience. 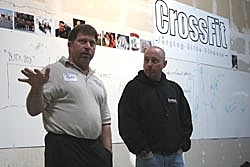 When Glassman speaks to an audience, it’s usually a bunch of Crossfit level I/II certification hopefuls. Students looking to better themselves might not listen to them, but trainers look for the best material definitely will. And then their student’s (at least Coach Glassmen’s) go walk the walk and become crazy fit, and earn the credibility needed to train others (Murph, Annie, Nicole, Amundsen, etc). I guess they both had to start training clients first, but maybe they had the bodies to back their theories up back then, whereas now they don’t really need to. This isn’t an argument one way or another about this post, but just a thought. Speaking of swimming if you look at a lot of collegiate swimming coaches, Phelps’ coach included, all of them are overweight and look absolutely nothing like an athlete. I think looking the part is good for marketing, and perhaps for credibility, but has nothing to do with knowledge on a particular topic. Take the Van Gundy brothers, both coaches in the NBA. They are surrounded by 6″11 athletes, and both of them look like they just left from a Star Trek convention. However, both have been very succesful coaches! Just for what it’s worth, Rip is a very strong human. Also has the best eyes of any coach I’ve worked with- made me realize what exactly you get from coaching people for decades. Does Poliquin claim to be natural? I’ve been around gyms for about 25 years and arms like that usually have some chemical assistance. steriods of course is the other big issue in debates like this. To my knowledge, Chris, Poliquin has never publicly claimed one way or the other. I agree with you, though, the appearance does, in pictures at least, look “enhanced”. I’ve been accused many times, though, of “enhancing” myself — which I can say, unequivocally, that I have never taken advantage of chemical aid, even under the pressures of competitive athletics (and this at a time when detection was a joke). For this reason, I tend to give people benefit of the doubt, until proven otherwise. If you ever want to hear a reader’s feedback 🙂 , I rate this article for four from five. Detailed info, but I have to go to that damn msn to find the missed parts. Thanks, anyway! I have been using BBS for 10 weeks-I am 58 years old and bench press max-1 rep has gone from 65kg to 85kg-actually I did 2 reps ! alan its over a month now? I am almost finished with BBS, I have enjoyed reading it, and I think the good Doctor makes lots of great points. I think he definitely is inspiring people to look at fitness and health with more logic and reason. I think the book provides a ton of great real world anatomy and physiology information. I think his modality and protocol is worth trying and being exposed to, and has merit and benefits to it. I do think that even though Mcguff isn’t overly arrogant about it, he does imply that his way is “THE WAY”. I tend to be a little doubtful of anyone that claims that one method or way is the only necessary way of doing it or the best for everyone. From what i’ve read he gives very little details regarding capability and accomplishments of real life examples of people that exclusively do the super slow big 5 workout, other than John Little and maybe a few other examples that should fall into his 2.5% that should be disregarded as genetically gifted anomalies. He quickly goes into disregarding using elite level athletes or fitness enthusiests in statistics supporting other workout protocols because of the influence of their genetics more so than their training regimen, but the flaw with that is novices who are the majority that fall into the middle of the statistical bell curve will benefit greatly from almost any program you put them on. The true test of how affective a program is, is not what it accomplishes with novices who will respond to any stimulus, but how an intermediate or advanced level person will creep closer and closer to their genetic potential, which is much more challenging at that point. If super slow and one set training on nautilus machines is so superior for building strength and recovering for 7 days to 2 weeks with no additional training stimulus, then why do almost all elite, advanced, and intermediate athletes and fitness enthusiasts do faster movement, more volume, more frequently. I agree that comparing the average joe’s training needs to an elite athlete or lifter’s training needs is apples to oranges, but comparing what stimulus gets valuable improvements in an elite athlete’s results and performance is completely valid. I agree that some or many of those methods may come with increased risk, and being an elite athlete probably means some kind of wear and tear on the body, but not being prepared for the varied tasks sport or life may throw at you will increase your risk of injury and wear and tear if your body isn’t trained to handle fast and explosive movements, free weights, and anything else that falls outside of the margin that is the super slow nautilus big 5 done once every 1 to 2 weeks. Crossfit is an example of a 6 day a week training program that has delivered regular and abundant gains to its participants. P90X is another example of a 6 day a week program that has delivered great consistant results to the particpants that adhere to it. There are too many real world examples of people that haven’t nullified or blunted their strength or muscles gains by training more frequently, or with all sorts of other different protocols, variables, and modalities. At what point do you admit that plenty of people that don’t fall into the top 2.5% do quite well with a variety of methods, and many of those people are able to do it safely with little or no injuries. Why would the average joe want to expose their body to serious damage for fitness if they don’t have to? Naturally those who want to be athletes destroy their bodies in pursuit of this goal, and typically the average person has thought they must also take part in destructive activity to gain some fitness. Anyone asks me I tell them to try Body by Science first, and only if it doesn’t work for them try something else. As I recall the book also makes the point that many training protocols are maintained because they appear to work, but rarely have those promoting those training methods tried briefer, more intense training to see if the same can be achieved in less time and with less wear. I guess that’s the thing about wants/desires — one man’s desires (in this case, hypertrophy or sporting prowess) may be totally illogical to another. I don’t think every trainer should have to be Mr Universe, but they should be accomplished at whatever sport/activity they partake in. If your trainer’s a powerlifter, it doesn’t matter if he’s fat if he’s got an 800 lb squat. likewise if you trainer’s a marathon runner, you wouldn’t expect him to look like Ronnie Coleman. This is a great read. Much like I was reading the other day about the link between exercise and IQ levels. Good, insightful, and most of all correct post, but “irregardless” is not a word and I believe having it written there detracts from your credibility.